Supporters of former Brazilian president believe Luiz Inácio da Lula should be cleared from corruption allegations. 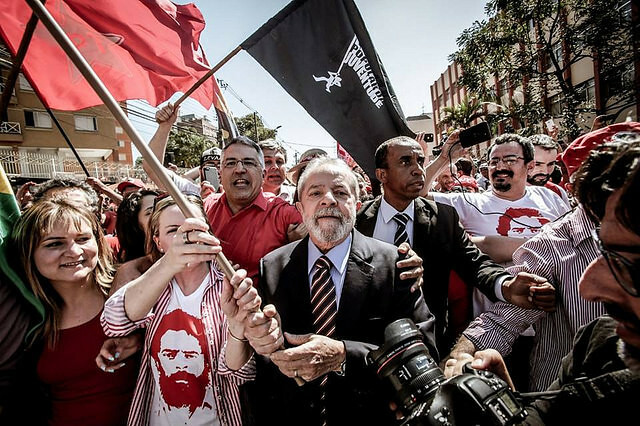 Supporters of former president Luiz Inácio da Lula gathered in the city of Curitiba on Monday in order to lend support to the ex head-of-state, while he appeared before federal judge Sérgio Moro, the lead judge in the ‘Operation Car Wash’ anti-corruption investigation. The mass mobilizations marked the 2nd day of protests, which aim to promote the struggle for democracy in the country. An estimated 7,000 people attended yesterday’s rallies, which were held near the city’s Federal Justice building. "This isn’t just about the defense of a single man but this also has to do with defending democracy and also defense of this country’s political project,” Ana Julia Ribeiro, a student attending the march, said yesterday. The former president, who has stated plans to run for re-election under the Workers Party (PT) in next year’s general election, rejects all the accusations of wrongdoing and says he is the victim of political persecution. “I think he should be absolved,” said Veio de Teresina, one of Lula’s political supporters that participated in Wednesday’s marches. Lula is currently appealing a legal sentence handed down by Judge Moro last July. If the appeal is not granted then Lula will be ineligible to compete in the general election. "He [Lula] is very important for the Brazilian nation, especially for the country’s most disadvantaged populations,” said Lenir Maria Gomes, who traveled from the city of São Paulo in order to participate in Wednesday’s political activities. During his two terms as president between 2003 and 2010, Lula, a former union leader, assisted in helping lift millions from poverty in Latin America’s largest economy.